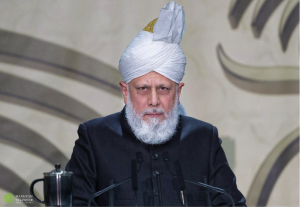 Keynote Address delivered by Hazrat Mirza Masroor Ahmadaa, Khalifatul Masih V, Head of the worldwide Ahmadiyya Muslim Community on 17th March 2018 at 15th Annual Peace Symposium UK held at the Baitul Futuh Mosque in South London. “All distinguished guests, Assalamo Alaikum Wa Rahmatullahe Wa Barkatohu – peace and blessings of Allah be upon you all. In today’s world, we often see the major powers and the international institutions make schemes or plans that are aimed at bettering the lives of people around the world. In recent times, one of the issues that many politicians and intellectuals have debated and campaigned about, is climate change and specifically a reduction in carbon emissions. Certainly, striving to protect the environment and to look after our planet is an extremely precious and noble cause. Yet, at the same time, the developed world, and especially the world’s leaders, should also realise that there are other issues that must be tackled with the same urgency.